As you age, your immunity declines. 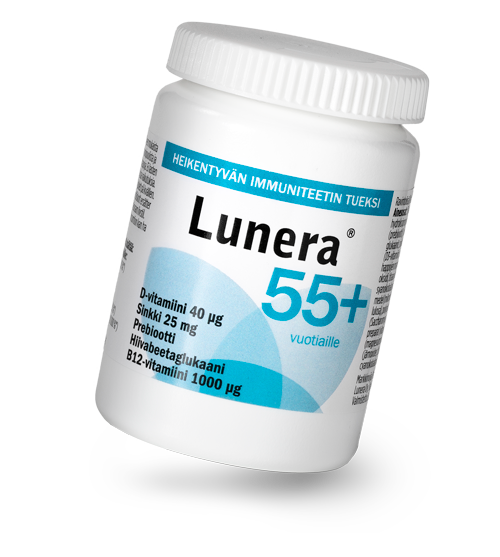 Lunera 55+ is designed to delay the decline of your immune system. It is a basic daily supplement to support the healthy aging of people over 55. For people over 55 years old, 1 tablet a day, for example in the evening. The tub contains 60 tablets, i.e. enough for 2 months. Do not exceed the daily dose. Beta glucan is a carbohydrate found in oats, barley and yeast, for example. Beta glucan derived from oats and barley helps to lower your blood cholesterol. The (1.3)-(1.6)-beta-D-glucan in baking yeast affects your body’s defence mechanisms in several complex ways. Beta glucan activates phagocytosis, i.e. the ingestion of microbes, and the production of inflammatory cytokines and, consequently, the production of gamma interferon. In vitro observations prove that beta glucan activates the immune response. In preliminary clinical studies, intake of beta glucan for 16 weeks significantly reduced incidences of the common cold and its severity compared to the placebo. Beta glucan also affects your blood sugar levels. Vitamin B12 deficiency is common in Finland mainly with the elderly. The symptoms include anaemia, memory loss and altered sensations. Vitamin B12 (cobalamin) is a water-soluble vitamin naturally found only in food of animal origin, such asred meat, dairy products and eggs. Vitamin B12 is needed for enzyme-catalysed reactions, which relate to DNA synthesis, fatty acid metabolism and myelin synthesis. Vitamin B12 deficiency is common in Finland mainly with the elderly. Approximately 10% of the elderly have been found to suffer from vitamin B12 deficiency. This is usually due to the malabsorption of the vitamin, most frequently atrophic gastritis. A normal diet includes a sufficient amount of vitamin B12, which is stored in the liver. However, an elderly person’s diet may become one-sided, in addition to which the deficiency of vitamin B12 may also be due to insufficient intake. People on a vegetarian diet may also develop a vitamin B12 deficiency. Metformin, which is commonly used to treat type 2 diabetes, may reduce theabsorption of vitamin B12, as can heartburn and acid reflux medicine thatinhibits acid secretion (proton pump inhibitors). Vitamin B12 deficiency typically causes anaemia, characterised by enlarged red blood cells. It is important to emphasise that vitamin B12 deficiency also causes neurological symptoms, such as memory loss, altered sensations, muscular weakness and depression. If treatment is not begun early, these symptoms may become permanent. This is why it is important to consider the possibility of vitamin B12 deficiency early. Anaemia caused by vitamin B12 deficiency is normally discovered with a complete blood count. However, a complete blood count does not reveal vitamin B12 deficiency in its early stages. Vitamin B12 deficiency is verified by measuring vitamin B12 levels in a serum sample.Today, the measuring of the active form of vitamin B12 is recommended (test number 1142). The remedy for vitamin B12 deficiency is vitamin treatment. Vitamin B12 can be administered by injections or tablets, depending on the cause of the deficiency. Vitamin supplements can be used preventively for the elderly. Zinc influences the activity of more than 300 enzymes. In terms of quantity, zinc (Zn) is the second largest micronutrient in the human body after iron. Humans need zinc daily, because it does not store sufficiently in the body. Good sources of zinc include meat products, shellfish, dairy products, wholegrains, nuts and green vegetables. Zinc affects your physical health in many ways. It is involved in cell division, protein synthesis, wound healing, DNA synthesis and the function of your body’s defence mechanisms. Zinc influences the activity of more than 300 enzymes. Zinc deficiency is rare in developed countries, but the elderly have been discovered to have low levels of it. Low zinc levels are linked to susceptibility to infections and decelerated recovery from inflammatory diseases. Zinc deficiency also causes disorders in gastrointestinal function. Zinc plays a significant role in the operation of the body’s defence mechanisms. It affects both innate and adaptive immunity. Zinc deficiency reduces the function of lymph cells and all parts of the body’s immunity. A zinc supplement, on the other hand, may reduce the inflammatory response and activate the immune response. Zinc supplements have been found to increase the number of elderly people’s T lymphocytes, which are important for the body’s defence mechanisms. Vitamin D deficiency (25-hydroxy vitamin D level in serum sample below 50 nmol/l) has historically been linked to skeletal diseases, because vitamin D deficiency causes rickets in children and osteomalacia, i.e. soft bones, in adults. Recent studies have shown that vitamin D affects the body’s defence mechanisms in many ways. It efficiently activates the body’s innate defence mechanisms by increasing, for example, the quantity of peptides known as cathelicidins, which prevent the growth of viruses and bacteria. Vitamin D also influences the body’s adaptive immunity by regulating the function of T cells. It strengthens the function of the respiratory tract’s epithelial cells. Surprisingly, vitamin D also have marked anti-inflammatory effects. Several studies have shown that people with a low vitamin D content in their blood suffer more respiratory tract infections than those whose vitamin D content is considered sufficiently high. There is also proof that a significant amount of vitamin D supplement reduces respiratory infections in people who suffer from recurrent respiratory tract infections or whose defence mechanisms are impaired. Vitamin D has even be compared to antibiotics. At the same time we must be aware that a vitamin D supplement on its own will not significantly reduce the number of common colds in healthy children or adults. This is probably due to the complexity of the body’s defence mechanisms. Vitamin D is found in food (vitaminised milk and fat spreads, fish, egg, liver, mushrooms) and sunlight. In many countries, however, these are not sufficient to keep the body’s vitamin D content at a sufficient level. In Finland The National Institute for Health and Welfare recommends a 20 ug vitamin D supplement a day for elderly persons. It is possible that this dose is not immunologically sufficient for everyone, and the recommended blood level for aging persons is 75-100 nmol/l. The correct dose of vitamin D is a contentious issue. There is also controversy about whether an otherwise healthy person should have their blood vitamin D level tested. With the elderly, measuring it is supported by the fact that for example in Finland approximately a fifth of adults have been discovered to have a vitamin D content below the deficiency limit (50 nmol/l). Vitamin D deficiency has been linked to numerous diseases, such as cancer, diseases of the blood-vascular system and diabetes, but there is no indisputable proof for this. Polydextrose is a prebiotic dietary fibre, which helps to increase food mass in the bowel and prevent constipation. A prebiotic is an inorganic and safe, fibre-like nonabsorbable food carbohydrate. It promotes the growth of intestinal bacteria that are beneficial for the body, such as lactobacilli and bifidobacteria. Prebiotics exist in breast milk, formula milk and food, such as mushrooms, asparagus, onions, garlic and soya beans. There is evidence to suggest that prebiotics reduce respiratory tract infections in young children. Polydextrose is a prebiotic. It is a glucose polymer in structure. The bacteria in the large intestine use polydextrose as nutrition, and polydextrose increases the number of beneficial intestinal bifidobacteria. Polydextrose increases food mass in the bowel and prevents constipation. Polydextrose is generally well tolerated, but like other prebiotics, it may increase the production of gas in the bowel and cause flatulence. In short, polydextrose changes the gut microbiota for the better. Intestinal microbiota extensively regulate the body’s defence capability and several other functions and are studied actively. Most recent research results have shown that intestinal microbiota also affect brain function. Vankionkuja 20, 21410 Vanhalinna, Finland.